"Our driveway looks great, with just the right amount of hardstanding and plants, thanks Ben and Sam for your hard work"
The front garden resembled a typically neglected 1970’s style garden, mostly lawn with a side path formed from concrete paving slabs. 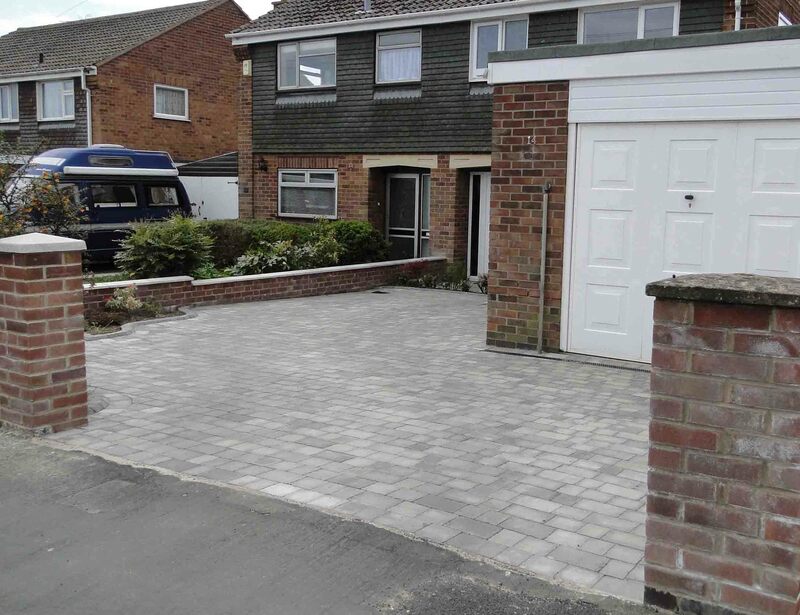 The brief was to completely renovate the front garden into a driveway that could easily accommodate two small cars. They didn’t want any shortcuts to be taken and stressed the importance of having a durable driveway that will serve them well for a long time. Their boundary comprised a dilapidated timber fence, which they wanted to change for a durable brick wall. 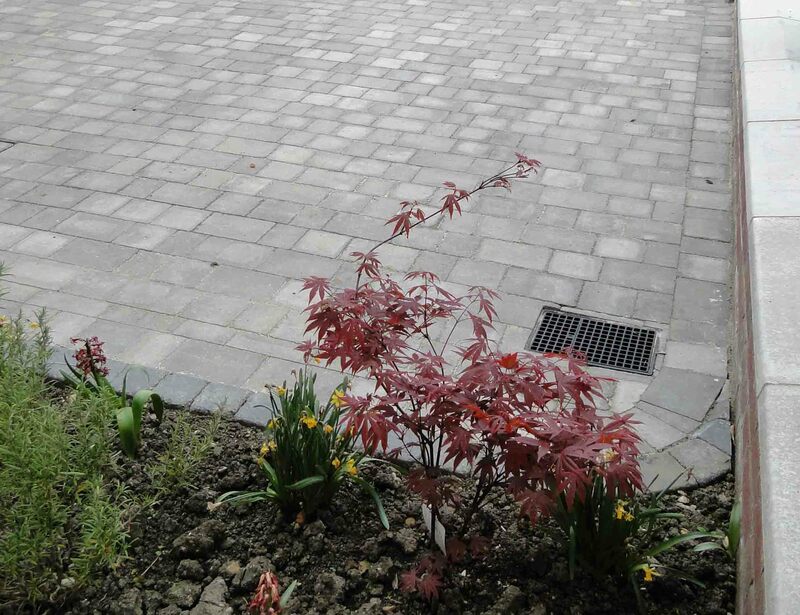 Planting was to be kept to low maintenance plants, kept in borders around the new driveway. After working up a few sketches, the initial layout was in place, showing curved lines around the drive and a meandering path to the front door. Grey concrete blocks were chosen for the surface, and slightly darker grey kerbstones as edging. 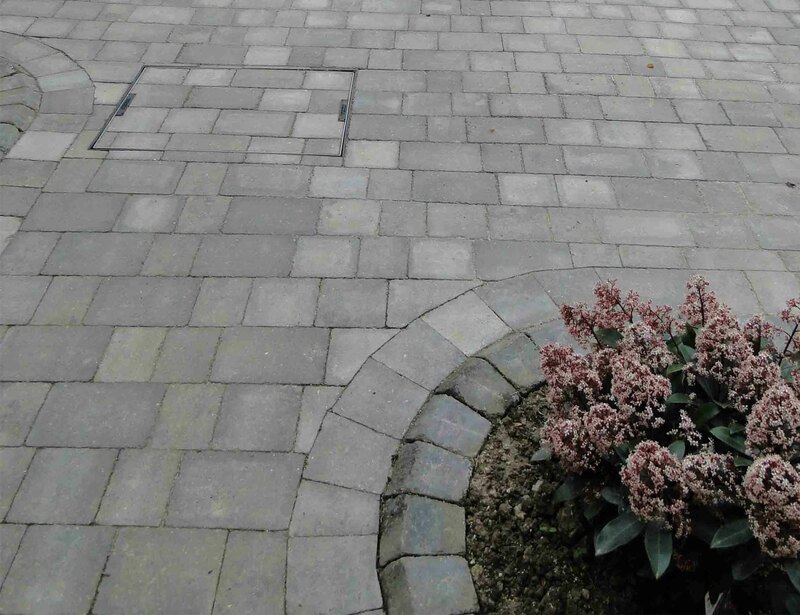 The blocks would be laid in an interlocking pattern stretching across the width of the drive, which will help to give it strength and last longer. The boundary would be built from double skinned bricks with a concrete cope on top to match the style of the street. The bricks are called heathers and they will be laid in a Flemish bond, with every other brick laid across the wall width for added strength. The end solution was an attractive pattern of blocks formed from concrete with varying shades of grey. The driveway blocks are held in place with a stretcher course set against a kerbstone that has a very slightly raised upstand, to give the border planting a little prominence over the drive. This combination of greys and soft border planting works very well and the homeowner is extremely pleased. The gradient of the driveway has been laid to achieve quick disposal of any rainwater whilst not too steep as to impair parking. Posted in driveway, portfolio and tagged block, contemporary, drive, driveway, planting, setts.